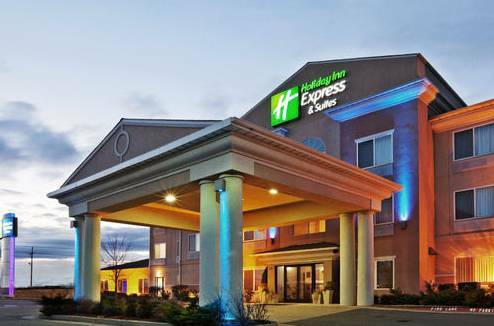 Welcome to the Holiday Inn Express Hotel in Chickasha Situated between Oklahoma City and Lawton, Chickasha offers easy access to metropolitan attractions while still maintaining a small town atmosphere. With a convenient location off I-44, just 35 minutes from the University of Oklahoma, our hotel in Chickasha is a great choice for all travelers. If you are in town for business, you might like to know that we are just minutes from Nicola Banking Systems, Hermetic Switch, Canadian Valley Tech Center and Grady Memorial Hospital. The University of Science and Arts of Oklahoma is also nearby. Naturally, we have free Wi-Fi access throughout the hotel and a well-equipped business center. With our 700-square-foot facilities, hosting a meeting in Chickasha has never been easier. Our hotel's location in Chickasha, OK makes visiting the area's top attractions a breeze. For car fanatics, we're near the Antique Auto Museum and Grady County Fairgrounds, home to the annual Antique Auto Swap Meet. Chickasha is also home to the annual Festival of Lights held at Shannon Springs Park from Thanksgiving to New Year's Eve. Numerous convenient amenities await our hotel's guests. While in Chickasha, OK, you can stay fit in our fitness center. After a long day, you can relax in the whirlpool or the indoor pool. Choose from a selection of hot and cold items at our complimentary Express Start Breakfast Bar, served each morning. We look forward to your upcoming visit! The Grand Room - located on the first floor just off the libby. Seating capacity of 40 theatre style; 18 classroom style. 11 Soccer fields, 15 Ball fields ( Softball/Baseball ) ADA Accessible Restrooms, 2 Full Concessions, dressing/bath facilities, jogging trails, playgrounds, sound system and paved parking. Features 3.5 million Christmas lights, biggest and best light show in Oklahoma as well as one of the top holiday destinations in the nation. Thanksgiving night through New Years Eve. - University of Science and Arts of Oklahoma. Oldest Public Liberal Arts University in America. Located on 75 acres, formely known as Oklahoma College for Women. Rock Island Train Depot, the museum displaying auto and train memorabilia. The only gun designed to hurl a nuclear shell at an enemy. One of the surviving M65-280 Atomic Cannons, nicknamed "Annie," is displayed outdoors at Fort Sill. Museum includes the world's largest public collection of Hitler items, including his cape and the bathroom mirror from his Berlin bunker. Military exhibits include a child-size Mickey Mouse gas mask. Lots of hardware on display outdoors.